Brad Lyons is determined to make up for lost time after six weeks out with a double cheek fracture. The Coleraine midfielder made a sensational return to action in last week’s draw at home to Crusaders. Playing in a custom made protective mask the Ballymoney played his part in the Bannsiders’ goal, but he was just pleased to be back in the action again. “It was unbelievable to be back out playing again,” he said. “I’ve been working hard, Oran, Trevor and Winkie have been putting me through my paces the last two or three weeks - it was like a mini pre-season. “They absolutely ran the legs off me. “Coming back I knew my fitness and sharpness was better than ever. “It’s a brilliant feeling being back in the matchday squad again,and being part of everything again. “You’re not looking over and having to watch them train. “I had to go up to Belfast a couple of weeks ago to get a mould made of my face. “I was expecting something a bit more basic, but it was all computer imagery. “They printed out a 3D mannequin of my face and used that as the mould for the carbon fibre mask. “I trained a few times last week, including an extra session with the Under-18s just to get used to it. “There’s a tiny bit around the nose which restricts your vision a wee bit, but once you’re playing you don’t even notice it, you just want to get on with things. “At the minute I’m not 100 per cent sure how long I will have to wear it, but probably until the new year at least. Lyons may not have been able to take part in games over the last month, but he said the buzz around The Showgrounds is fantastic. “We have a lot of experienced players in our side, and players who have been here a long time who know what it is like to be at the other end of the table,” he said. “There’s so much pressure on when you’re down there. “But there’s no pressure where we are at now, everyone is buzzing being at the top of the league. “We go out and enjoy ourselves, training is unbelievable, we want to win as much in training as we do on a Saturday. “If you don’t have that on a Tuesday and Thursday then how are you going to have it on a Saturday? “All that comes from the coaching staff Oran Kearney and Winkie Murphy have won everything in Irish League football, and Trevor McKendry has such a knowledge of the game. 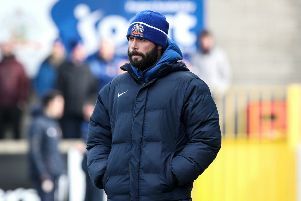 The Bannsiders have a run of games against teams in the bottom half coming up, but Lyons knows the message from the manager will not change. “There’s three points up for grabs every game it doesn’t matter who you are playing against,” that’s what the boss keeps saying to us,” he said. While Coleraine are riding high at the summit Carrick Rangers are finding things tough at the bottom. They have gone six games without a win, and suffered some heavy defeats, but Boss David McAlinden praised his side’s attitude following their narrow County Antrim Shield semi final defeat to Crusaders. “I thought our attitude was better,” he said. “Yes, we are disappointed with the result and missing out on a major final, but the greater picture is, we gave our supporters the least that they deserved in terms of hard work and determined. “The boys showed they cared for the shirt they had on their back. It’s not rocket science. If you work hard and are commited, then you show the club and supporters that you care. That hasn’t been there in the last couple of weeks for me. “I’ve questioned the players. I’ve had a go at them publicly and privately. It’s not something I enjoy doing. I’m not a manager who likes to criticise my players publicly, I try to protect them as best as I can. “I asked for a response following Saturday’s poor showing at Dungannon, and they did that magnificently.